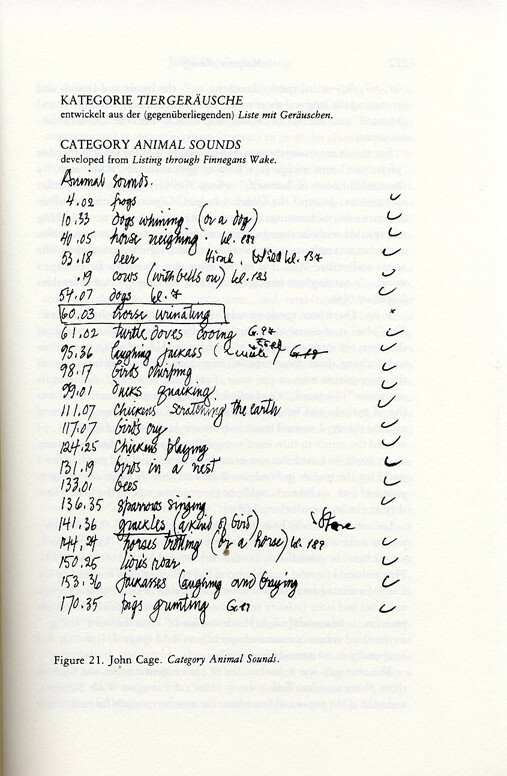 A page of John Cage’s ‘Roaratorio’ in Perloff’s Radical Artifice. Image courtesy of Marjorie Perloff. During a season of two-word movie titles with hard consonantal punch — Home Alone, Total Recall, Die Hard, Naked Gun — I listened to Charles Bernstein and Marjorie Perloff pair other words to communicate the essence of her forthcoming book. Old terms — avant-garde, experimental, innovative — seemed worn out. So did the academically toned nuances of “studies,” “approaches,” or “investigations.” More tired were the residuals of the plague of postmodern “signs” of the “hetero-hegemonic” “(un)conscious” and other neo- and pseudologisms. How better to signal the wind change of 1980s poetics than by imitating the language styles abroad in media culture. Radical Artifice (University of Chicago Press, 1994) took up the challenge of coming to terms with how, why, and to what effect the uses of media culture were changing the ground from which poetry emerged. Perloff addressed the syntactic and structural elements of these texts, not just thematics or linguistic motifs, to understand the role and place of poetry in a world where language was reinvented, recycled, banalized, produced, extruded, put into lights, taken down off the screen, put on display, flaunted, tarted up, and toned down in rapid refresh cycles of commerce and entertainment. The internet did not exist. The graphical user interface was still a pixilated screen space on a desktop computer. The beginnings of electronic literature as experiments in hyper-this-and-that circulated only on disks and CDs, whose production had a geeky technical character that put it all just out of reach of any but the dedicated codesters. My point? The megaburst of mass media from which the work studied in Radical Artifice had burgeoned forth was a post-WWII electronic and commercial wave of television, advertisement, large circulation glossy magazines, billboards, and film. Fueled by a feverish economic expansion, the language of media overtook all other forms of cultural expression. Nineteenth-century writers and early twentieth-century poets may have recognized the exhaustion that their own overstimulated psyches experienced in the face of posters layered onto hoardings, radio transmissions, and photographic images, films, and newspapers. But with each passing decade the increase in the sheer scale of visual-verbal-musical media culture was unprecedented. The question was not simply how the individual voice was to take shape in such a heteroglot linguistic field, but how, if it did, it might register and be heard at all. In the 1970s, theoretically inclined poets in Canada, New York, the Bay Area, and elsewhere in the Anglophone world had embraced and embodied the tenets of Roland Barthes’s death of the author, constituting themselves as produced subjects and their texts as expressions of cultural processes. Conceptual work abounded, procedural in its methods of production, antilyrical, combinatoric, and methodologically formal, concerned with external structure rather than interior life. The techniques of John Cage and Jackson Mac Low, the new sentence announced by Ron Silliman, poems made as lists or from restricted vocabularies, or improvised in performance to an unstructured line of associations and sounds — all were infused with a conceptual premise, that to make a contemporary work one went as far from emotional, perceptual, epiphanic experience as possible. Conceptual, minimalist, and procedural works had another feature in common — they eschewed the terms and terminology of mass media culture. Unlike pop art, and then hip hop, the edgy art and poetry of 1970s and 1980s was still committed to the notion of difficulty, of explorations esoteric and arcane that necessarily distinguished their zones of operation and methods of expression from the consumable pulp and pablum of mass media. Modernism had engaged the vernacular, the individual voice freed from the constraints of literary formulations and prescriptive forms. But by the late twentieth century, the forces conspiring against poetic expression were not those of tradition and its conventions, but the tidal wave of consumable discourses let loose in the massive production machines of entertainment, commerce, and media. What was the role of poetry in such a world? Its identifiable features? Its methods and reasons for being? 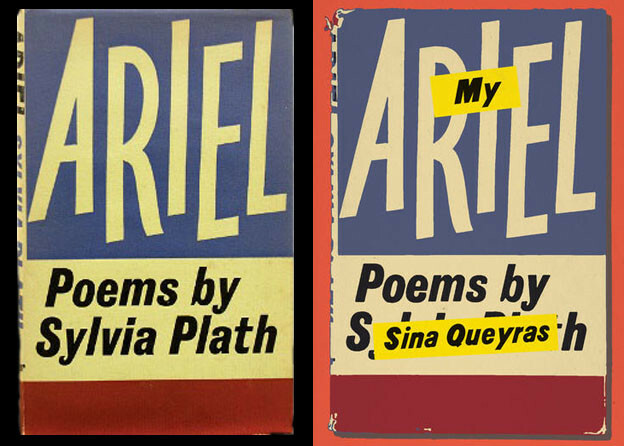 How to explain the many unreadable works of contemporary literature? Why write works so difficult they were almost illegible to a wide number of readers? Explanation and critical description are the critic’s task, but it took courage to champion the cause of the works examined in this volume when few academics ventured beyond the well-mapped territories of modernism, the Beats, and the New York school. Radical Artifice called attention to modes of expression at work in living poetic discourse, to show the method in their peculiar made-ness.